Malaysia is a hugely diverse country and supreme holiday destination. Divided into Peninsular Malaysia and the island states of Sabah and Sarawak on Borneo, each offers a wealth of unique attractions. For travellers interested in history and culture, the capital city, Kuala Lumpur, as well as other major cities, such as Putrajaya, Melaka and George Town, are fascinating to explore. Eco-tourists have an amazing choice of destinations from the Taman Negara National Park on Peninsular Malaysia to Gunung Mulu National Park in Sarawak and the Kinabatangan River in Sabah. Visitors to these natural places will be able to see Orang-utans, the Malayan Tiger, the Western Tarsier, Proboscis Monkeys and many other primates. Birdwatching in Malaysia is particularly rewarding with 656 species recorded in Peninsular Malaysia and 669 on Borneo. For the adventurous, there are challenging mountains to climb, such as Mt Kinabalu in Sabah, some of the world’s best diving around Sipadan Island and exciting jungle treks through primary forests. But Malaysia is also perfect for relaxing, whether on the beaches of Langkawi, Cherating, Perhentian Island or Layang Layang and wherever you are, there will always be exciting foods to try. From simple street food snacks to sophisticated five-star restaurants, there is a wonderful range of dishes as testimony to Malaysia’s multi-cultural make-up. Enchanting Malaysia is as varied as the country itself introducing travellers through words and photographs to all of the wildlife and architectural wonders, thrilling adventures and cultural highlights. 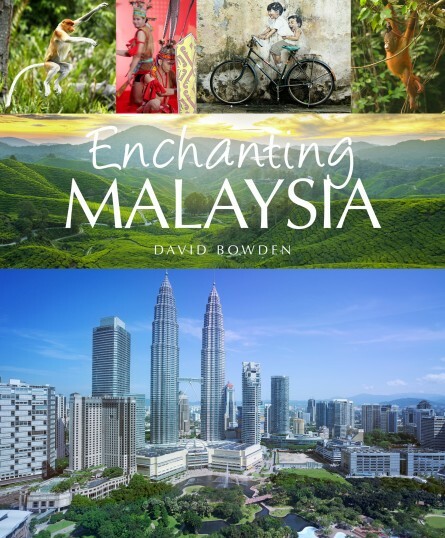 David Bowden is a freelance journalist based in Malaysia, specializing in travel and the environment. While Australian, he’s been living in Asia longer than he can remember, and returns to his home country as a tourist. When not travelling the world, he enjoys relaxing with his equally adventurous wife Maria and daughter Zoe.